Good luck to the Tipperary senior hurlers for the Allianz Hurling League final against Kilkenny on Sunday next May 5 at 3.30pm at Nowlan Park in Kilkenny. Ticket prices are as follows: 1) €20 for an adult stand ticket if purchased before match day and €25 if purchased on the day. €10 concession refunds for OAPs and students with valid id at designated stiles; 2) €5 for juveniles accompanied by an adult. Supporters are encouraged to buy their tickets in advance to both get better value and to save delays on the day. Please also make sure to come early to Kilkenny. We hope there will be big Tipperary support present – it’s important and makes a difference. The game will be refereed by Barry Kelly of Westmeath who is refereeing his second Allianz Hurling League final – the first was in 2008 when Tipperary defeated Galway. Sunday’s game will be preceded by the Division 1 camogie final between Cork and Wexford – check press for start time. While there has always been a lot of interest in competitive games between the counties, it is unlikely if not a certainty that the record attendance for a league match of 43,721 for the Final at Croke Park on May 12, 1957 will not be surpassed in the near future. Tipperary won that game by 3-11 to 2-7 for Kilkenny and were captained to victory by Mickey “the Rattler” Byrne of Thurles Sarsfields. Recent attendance were as follows: 2013 – 5,697; 2012 – 10,664; 2011 – 9,495; 2010 – 20,254 (Free admission); 2009 – 17,078 Final; 2009 – 9,000 approx. The 2013 Bord Gais Energy Munster GAA Under 21 Hurling Championship Quarter-Final between Tipperary and Limerick originally scheduled for Wednesday June 6 has been moved to Friday May 31 at 7:30pm in Semple Stadium. Both counties agreed to the change given that they meet in an eagerly awaited Munster Senior Hurling Championship Semi-Final on Sunday June 9 at the Gaelic Grounds Limerick, just 3 days after the original fixture. Thanks to all those who supported and organised the Poker Championship of Tipperary to raise funds for Tipperary’s inter-county teams which took place at the Abbey Court Hotel Nenagh last Friday night. Over 150 players participated. Congratulations to Martin Quinn, Chairman of Canon Hayes Recreation Centre in Tipperary Town and past President of Muinter na Tire on being named the Tipperary Association Dublin’s Person of the Year for 2012. Martin’s list of involvement and achievements in local, community and sporting groups – at parish, town, county and national level – is most impressive and reflects a lifetime of dedicated service to others as a volunteer. His GAA involvement includes participation at all levels in his home parish club, Galtee Rovers/St. Pecauns, holding several positions on West Tipperary GAA Board and as a referee. He organises the annual Canon Hayes Sports Awards and is Honorary Secretary of The Tipperary Peace Convention. 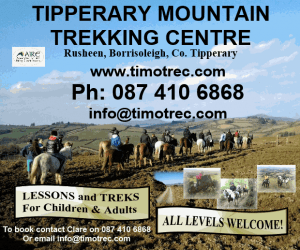 The Tipperary Person of the Year Award will be presented at the Association’s Annual Awards dinner on Saturday May 25 2013 in the Louis Fitzgerald Hotel, Naas Road, Dublin. Congratulations to former Tipperary and Thurles Sarsfields legendary hurler, Mickey “Rattler” Byrne, who will be inducted to the Tipperary Association Dublin Hall of Fame at their annual awards dinner on Saturday May 25 at the Louis Fitzgerald Hotel Dublin. A member of the famed Tipperary teams of the 1940’s and 1950’s he is still remembered today for his sterling and unstinting performances over those years. Mickey “The Rattler” Byrne was born in Dublin in 1923. The family moved to Thurles when he was just 2 years of age and, thus, began a love affair with hurling, Thurles Sarsfields and Tipperary. In 1939 he won a Dean Ryan Cup medal with Thurles CBS while playing as goalkeeper. Mickey played with the Tipperary minor team that lost the 1941 Munster final to Cork. Over the next few years Mickey’s hurling career took off and he won the first of his fourteen County Senior Medals with Sarsfields in 1944 while playing at centre field. The following year he was selected for the first time on the Tipperary Senior Team that beat Kilkenny in the All-Ireland final and in doing so he collected the first of his five Senior All Ireland medals. He also won 7 National League and was selected at right corner back on the GAA’s Hurling “Team of the Century”. Since retirement, he has been the recipient of many awards acknowledging his contribution to the game. In 2011 he published his life story – “The Rattler, Mickey Byrne, Tipperary Hurling Legend” which was received with great acclaim and which sold out in record time. Typical of Mickey, proceeds from the publication went to the Thurles Sarsfields Club and to local charities. This auction, which includes a signed Tipperary hurling jersey and an official photograph of the 2010 All Ireland winning team, is taking place in memory of Malachi Dunbar, a brave little boy who sadly passed away on the October 14 2012, age 6 years. The auction will take place at the Louis Fitzgerald Hotel, Naas Road, Dublin on Thursday May 9 2013 at 8pm with doors opening at 7pm. Admission is €10. The Jack & Jill Children’s Foundation and Temple Street Children’s Hospital were of immense support to Malachi and his family throughout his short life. Please help these amazing charities by supporting this event. For more details on the auction, including the brochure and online bidding options, please visit the website:www.malachisauction.com. Please support this worthy cause if you can. South Tipperary Sports Partnership in conjunction with South Tipperary Youth Mental Health Sub Group, South Tipperary County Council & South Tipperary VEC, is hosting an Awareness Talk on “Supporting Young People’s Mental Health” on Monday May 13 at LIT Tipperary – Clonmel Campus at 7pm. The talk will be delivered by Headstrong – The National Centre for Youth Mental Health, a non-profit organisation supporting young people’s mental health in Ireland. This talk will describe ways to promote positive mental health in young people and is of particular benefit to sports coaches and volunteers of sports clubs. The talk aims to ensure participants have an understanding of the key issues impacting on the mental health and well-being of young people, are familiar with the building blocks of mental health, are aware of the 5 a day for promoting positive mental health in 12-25 year olds, understand the value of listening as a way of supporting young people. The event carries no cost but registration is necessary as capacity is limited. Please email info@stsp.ie or call the office on 062 64783 for further details. Information concerning all areas in the GAA will appear in this section in the future. If you wish to include any item of interest in future articles, please contact the County Public Relations Officer Ger Ryan atpro.tipperary@gaa.ie on or before 3pm on Monday. 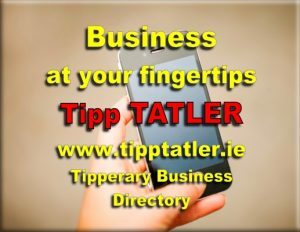 Visit the Tipperary GAA web site atwww.tipperary.gaa.ie keep up to date with all the latest news in Tipperary GAA circles.